Gorgeous (Malus 'Gorgeous') is a small compact flowering cherry tree with lovely scented apple blossom flowers. 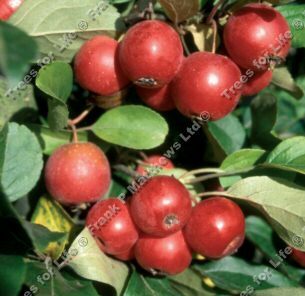 Large attractive fruits which persist well into November. Ideal for tangy pink crab apple jelly. A small height tree, so expect a height of around 5 metres after 10 years. The MM106 option (180-240cm) grows taller than the M27 (150-180cm)option and is the option that would reach around 5 metres in 10 years. The M27 option would be roughly half that depending on local conditions such as weather and soil. You still have the option of pruning a MM106 down if you need a smaller tree. This tree is supplied at a height of between 1.00 and 2.4 metres in a 7-20 litre container for year round planting and better results than from either bare-root or rootballed stock.